This was going to be a different review. On Sunday morning, when I was halfway through the book, I made a draft that was going to be another scathing critique of chick lit. It was going to talk about how I couldn't understand these chick lit heroines, how boring they are, how they expect their Mr. Darcys yet do nothing to earn them. But then something happened. I started getting into it. And now, having finished it, I am astonished to report that I actually enjoyed it. After the fun of The Secret History of the Pink Carnation, I was longing to read another British chick-lit book that would be light and fun and silly. Jane is a single thirtysomething woman dissatisfied with her love life. She is given a chance to live out her Jane Austen fantasies when she is willed a holiday to "Austenland" by a dead relative. 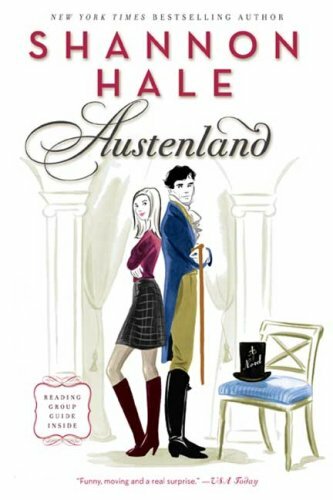 People (read: women) go to Austenland to be heroines in Jane Austen's novels, while actors are hired to fill out the male roles. Jane is expected to live completely Regency-style for three weeks. I despised the main character. First of all, she is ashamed and embarrassed about her Jane Austen obsession, so much so that she hides her Austen movies in a plant. But why? Why would any woman be ashamed of it? I don't understand. If grown women can go around proudly admitting they read and enjoyed Twilight and Fifty Shades of Grey, why on earth would they be ashamed of enjoying an author who is considered one of the canon, the literary greats, history's finest? Admitting you like Austen is like saying: I have brains and class. Jane, don't you know all the cool women are doing it? Then, as I said, things changed. I'm still not sure I "get" some of Jane's actions. But she did, in the end, prove to actually have a passion outside of her self-obsession, which was painting. I wish the author had developed that aspect of her personality more, but I'm glad it was there. I think the turning point for me was when Jane began to realize she may have genuine feelings for the actor hired to play the Mr. Darcy-like character. She starts to question what is real and make-believe. I loved the constant game of trying to figure out who is real, and who is false. There is a great scene in the book when they all put on a play, and Jane and Mr. Nobley (the love interest) talk about whether actors can start to have real feelings outside of their plays, which naturally carries a double meaning inside the story we're reading. Oh, and I can't wait for the movie. JJ Feild as Mr. Nobley? Yes, please.